The battle between Queensland and New South Wales for rugby league supremacy has ended and for the first time in the life of my nine year old nephew the trophy is returning south of the Tweed. Here are some reflections on New South Wales first series win in, for some, living memory. I know that this will be hard to admit for some Queensland fans however, the second half of game 3 aside, New South Wales were the better team in this series. Defensively they had a plan to shut down Queensland and it worked to perfection. Congratulations to New South Wales on your win. 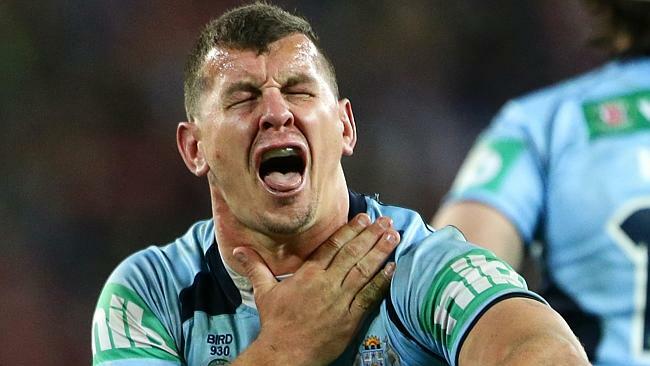 I have watched a lot of sport in my time but can anyone genuinely argue that the best actor in the game is not Greg Bird? Seemingly, according to Bird, he is never in the wrong and ought never be penalised EVER. Constantly blameless, in his own eyes, and constantly informing the referee that he is blameless either he is the most deluded person in the world or a magnificent actor. All of that has not even touched on his excellent performance to milk a penalty after tackling Nate Myles last night. I can not recall a better performance by a forward in a Queensland jumper than that of Corey Parker last night. He ran hard all night, tackled everything and threw more offloads than I think he has all season. This was just a great performance and gives hope to all blokes getting on in years and searching for a career renaissance. I am not an advocate of the abuse of referees. Indeed, I remain one of the few, it would seem, believers in the maxim that the umpire / referee is always right. That said, it has to be said that this was a series in which the refereeing reached new heights for, at the very least, questionable, decision-making. It effected both teams and did not effect the result of the series but bad refereeing only adds to the niggle between the teams which is not good for the game. Was I alone in wondering why we, as viewers, were put through a one on one interview between Brad Fittler and Laurie Daley in celebration of New South Wales series win last night? After all New South Wales has only won one series in the last nine haven’t they? If fans of the game ever needed a further guide to the bias inherent in Channel 9’s telecast of State of Origin football they had it last night. They just love it when NSW wins: not sure why I am surprised really. State of Origin is one the best sporting contests in Australian sport. This wasn’t a series that reached great heights frankly, in part due to the ongoing niggle between the combatants and the defensive manner of NSW’s game plan (for which they are to be applauded).